Griffin Technology launched its newest AppPowered accessory: HELO TC, a remote-controlled helicopter that you control with your iPhone, iPad or iPod touch. The HELO TC app transforms the Multi-Touch display of any iOS device into a remote control for HELO TC. 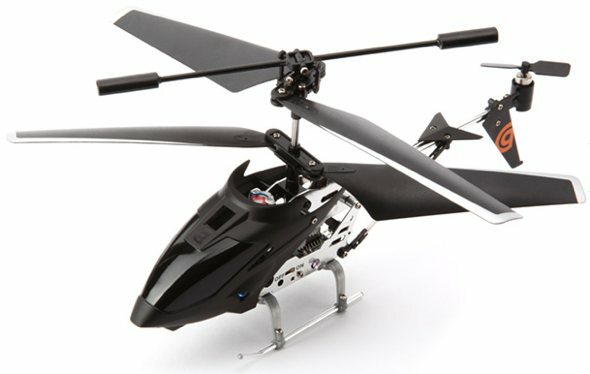 HELO TC is a twin-rotored, indoor helicopter built on a lightweight metal frame with a black polycarbonate body. It comes with a Flight Deck infrared module, which plugs into an iOS device to transmit control signals to the helicopter. Two modes of flight are available: Touch Control, using the Multi-Touch display to control HELO TC’s throttle and joystick; and Tilt to Steer mode, which uses the iOS device’s accelerometers: tilting the iOS device moves the helicopter forward, back, and side to side. The app can record and store up to three Flight Plans so you, or another pilot, can repeat a favorite flight pattern easily. Advertisement: Scratch Proof your iPhone. Buy the invisibleSHIELD. Lifetime Guarantee. HELO TC’s built-in battery recharges from any USB power source, including your computer’s USB port. The Flight Deck module, powered by 4 AAA batteries, plugs into the iOS device’s headphone jack. HELO TC, US$49.99, is currently available at Griffin’s website and will be at retailers nationwide for the holiday season. More info and video here. What’s all the Feiss about? Cheap coaxial heli to get those too cheap to buy the AR Drone. Out of stock at griffin. I’ll get one, just for the novelty. most of these are rebadged syma micro helis, which are a decent low end micro. im a long time rc heli fan, got a few that I own. Im not sure I’d want to control an rc heli with a touch pad. IR is plenty responsive indoors but even high end micros can have twitchy controls that take a bit of skill. I would expect a hard to control experience with this thing. i bet the majority of these are totalled with 3 flights. These can take some serious pounding. I’m sure they can survive more than just 3 flights. As for iPod/iPad/iPhone control, it seems to me that the Tilt-to-Steer mode might provide a bit more intuitive (if not exactly realistic, compared to a proper helo cyclic/collective/pedals) control. Either way, for inexperienced RC amateurs, this ought to be a lot of fun for very little money. Well you’ve brought up some good points and made me reconsider my original post. Using the Gyro on the iphone/ipad/ipod strangely did not enter my mind (kinda sad I know). I was picturing a bitmap of a typical 3 channel IR remote on the screen and dragging your thumb up to control motor torque for lift and blade pitch for steering. The control might be decent if the controls are responsive and tuned correctly, or if they at least offer a more advanced user the ability to tune the controls. Def will introduce a different way of flying to veteran pilots. This thing looks like a syma, or at the least a china knockoff of a china knockoff if syma did not make it. If its a Syma, the frames are tough, blades and tail rotor are the consumables. I’d check with Griffin about replacement blades before purchasing one myself. Micros are fun and I’ve went through a fair share of them over the years. I’ve got two outdoor birds now but maybe I’ll snag one of these to mess with around a bit. Not only can they be tuned correctly, but because we’re talking about the softer side of the controller, the code will allow for plenty of “padding” in the controls to maintain those small corrections necessary to stay aloft. As we become more experienced, the “padding” can be removed. I’d pay another forty-bucks if it came with an onboard IP camera. What a great commercial! Well done! Have real RC choppers and an AR Drone. The idea for an indoor/back yard toy is less impressive in life than concept. Hopefully I will be getting a Mikrokopter to replace my 330x. I can see it now. I’m about to land my new HELO TC on the blade of a ceiling fan when I get I call on my iPhone. The app quits to answer the call, and my new toy crashes to the ground splintering into a hundred pieces. I could think of better ways to spend $50 bucks. Buy a Syma S107G for $18 on Amazon and grab parts from it.